Due to the long history of railroad companies around the world, varying means of examination according to the specifications for the different railroad components have been carried out based on the general industrial progress of the country [1-3]. For more than 50 years the application of customized ultrasonic techniques for the examination of railroad components has increased, in comparison to conventional ultrasonic techniques used until to the end of 20th century. In this traditional atmosphere some accidents have disturbed the silent harmony of companies involved in the production of critical parts. More than ever high speed modern trains require modern and advanced examination techniques [4-8]. For practical application new ultrasonic techniques have been developed and optimized in co-operation with the German Railroad Company. In the present contribution the inspection of railroad axles will be described. The ultrasonic technique used for the examination is the phased array technique. The optimization of the phased array probes for the different geometries of the axles given was completed using a computer model for directivity calculations. In relation to the limited accessibility between wheel and brake angles of incidence for shear waves in the range between 28° and 72° are necessary. During the examination of the axles a a considerable amount of ultrasonic data must be stored (storage of the digitized A-scans). However, due to economic aspects the evaluation of this data should be carried out in a very short time. The whole examination of one axle should not exceed 5 minutes. Therefore we have developed a special evaluation program adapted to the particular problematic of the axle inspection. The build up of the whole inspection system was done with partners from the industry like Krautkramer and a division of the Research Department of the Deutsche Bahn AG. In this consortium the Research Department of the Deutsche Bahn AG was responsible for the specification of the inspection problem, Krautkramer for the organization of the whole technical follow up and BAM for the development and optimization of the ultrasonic inspection technique as well as for the evaluation software. Some examples concerning the optimization process will be described in the present contribution. Fig. 1 shows the geometry of a railroad wheel set for one of the German high speed trains. The drawback of this configuration is clearly visible. There is a very narrow gap between the wheel and the brake. Therefore the accessibility of phased array probes is limited. Nevertheless in addition to this major drawback, other disadvantages must also be regarded during the optimization process. Some of the axles have surface contours not only curved in the circumference but also in the axial direction. The optimization of phased array probes must consider this circumstance. For the given geometry of the wheel set angles of incidence for shear waves in the range between 28° and 72° are necessary. This guarantees defect detectability at the defective areas. Possible probe position for one particular case is shown schematically. Coupling surface cleaning is required on this position. The probes between the brake disks and the wheels coupled at the surface of a railway axle (full metal axle) are used for crack inspection in the wheel shrinkage and adjacent area as well as the journal area. The other probes are for the inspection in the shrinkage and adjacent area of the brake disks. Fig 1: Example of a railroad wheel set. Aforementioned and as schematically shown in Fig. 1, the accessibility of ultrasonic probes between wheel and brake is limited. Therefore only movement in the circumferential direction is practicable. This requires that the whole inspection of the area of interest can be carried out using this single line scan. To avoid increasing costs due to mistakes by the design and fabrication of phased array probes, calculations were carried out using the computer model ArrayCalculus. With the help of this program the crystal size can be optimized in regard to the limited accessibility between wheel and brake. A further optimization point was to minimize the amplitude drop of the directivity pattern between the needed angel of incidence in the range between 28° and 72°. Also the different geometrical shape of the axle in the area between the wheel and the brake had to be taken into account. One of the results of this optimization process is shown in fig.2. Basis for the calculation of the presented directivity pattern was a phased array probe with 16 elements made from composite material with a total crystal size of 22 x 20 mm2 and a middle frequency 2.7 MHz. A wedge angle of 48° fulfills the requirement of the amplitude drop in the directivity pattern. The calculation was carried out with a stepwidth of 4°. The calculated directivity pattern in Fig.2 illustrates that the amplitude drop is within the required range. A drop of less than 6 dB was reached except for the 28° angle of incidence. At that particular angle two wave modes are generated, the longitudinal wave and the shear wave. The increasing amplitude drop between 32° and 28° is due to the well known fact that at these angles longitudinal waves are generated. Therefore some of the ultrasonic pressure generated by the crystal is not more available for the shear wave propagation. Results of these calculations are the basis for the phased array probe construction. In addition to the aforementioned behavior of this pattern also a supplementary physical effect is clearly recognizable from the directivity pattern. If the directivity pattern between the angle of incidence in the range of 45° are compared with those at 68° or 72°, the divergence angle increases. The reason is that the physical effective crystal size is decreasing. With a simple equation as shown below, an estimation of this crystal behavior with increasing the angle of incidence can be carried out. It should be noted that for a given phased array probe a fixed wedge angle must be taken into consideration. Fig 2: Shear wave directivity pattern in the plane of incidence . With the designed and optimized phased array probe for this purpose experiments were carried out. Fig. 3 shows a section of a railway wheel set with one wheel and one brake disk. Between the wheel and the brake and beside the brake, phased array probes are coupled. Probe #1 is for the inspection of the shrinkage area of the disk and probe #2 for the inspection of the wheel shrinkage area and the journal. 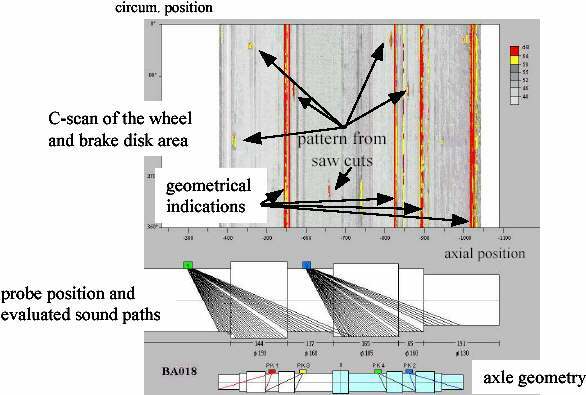 Nevertheless for the inspection of the whole circumference of the axle, A-scans for every angle of incidence (stepwidth Da=2°) in the range between 28° and 72° are recorded and stored. For the wheel and journal area inspection this situation is demonstrated schematically in Fig. 4. Fig 3: Phased array probe arrangement at the railroad axle. 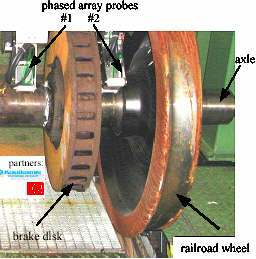 Fig 4: Phased array probe for railroad axle inspection. In order to speed up the evaluation procedure the ultrasonic data must be compressed in a suitable form e.g. due to the evaluation of the ultrasonic data, only data in a gate are important for the evaluation. The gate position follows the OD geometry of the axle as schematically shown in Fig. 5. This guarantees that all physically relevant data are used for the evaluation. In the next chapter some results received during the experiments of the prototype probes are described. Fig 5: Angles of incidence and gate position schematically. On a 1to1 scale test wheel set provided by the Deutsche Bahn AG (DB) the phased array prototype probe was used for the inspection. Saw cuts at specified positions on the axle were made with depth extensions of 2 mm. The most important areas are the transition between the free surface and the shrinkage areas of the wheels and the brake disks. After cleaning of the coupling areas on the axle, the phased array probes are coupled for the experiments. All the ultrasonic A-scans stored during the inspection are used for the evaluation in the area of interest. For the particular case of the railroad axle inspection this area is limited due to the OD surface of the axle. Also for fast evaluation of the ultrasonic data the computer based program for the data presentation was optimized in accordance with the requirements of the maintenance branch of the Deutsche Bahn AG. The examples presented in the following have been prepared with this program. Fig. 6 presents the results received from the axle of the test wheel set. Rotating the axle enables the inspection of the whole circumference. The correlation between the probe position and the position on the axle is drawn on the figure below. The colors of the probes correspond with the probe position on the left. That means the inspection area was at the left hand side of the axle. At the C-scan presentation on the top of the figure some echo indications are very clear visible, especially the echo indications with an extension of the whole circumference of the axle. These are generated due to the change of the diameter of the axle. In the neighbourhood of these echo indications some other irregularities are presented with a limited extension in the circumference. These are produced by the saw cuts. The axial position can be roughly estimated with the help of the drawing at the bottom of this C-scan. There are echo indications at the shrinkage area as well as in the areas between. The signal to noise ratio is for all of the saw cuts signals more than 10 dB: However this is enough for a mechanized ultrasonic inspection (required > 8dB). Further information about the sound direction is plotted in the drawing below the C-scan. The ultrasonic data generated in the vicinity of the geometry change (corner) are not used for the evaluation i.e. the A-scan information of the main path to the corner. Due to the high amplitude of the reflected signal at this special reflector all other relevant information such as that from cracks in the vicinity of this geometry step diminish. In the present example the saw cut indication at an axial position of about 800 mm and 30° in the circumference is not clearly distinguished from geometrical indications if the above mentioned procedure will be changed. The C-Scan in Fig. 7 shows the result of the inspection on the right hand side. The produced saw cuts are in a symmetrical position compared with the left side. Therefore the measured results are also comparable. All pronouncements made by the discussion of the results presented in Fig. 6 are valid for Fig.7. When an axle with three brake disks is expected for inspection then two additional phased array probes are necessary. Fig. 8 shows the result measured at the shrinkage and adjacent area of the brake disk. The geometrical indications in the whole circumference as well as some saw cut indications with a limited circumference extension are recognizable. Again the drawing below the C-scan gives the geometrical situation of the probe position and the sound paths used for the evaluation of the A-scans. As expected the detectabilty of crack like defects in the shrinkage and adjacent area fulfill the requirements i.e. the signal to noise ratio for 2 mm deep saw cuts is above 8 dB. A comparison of the evaluation data of all results received during the optimization process in the laboratory shows that with this special kind of phased array ultrasonic technique all expected defects are detectable. 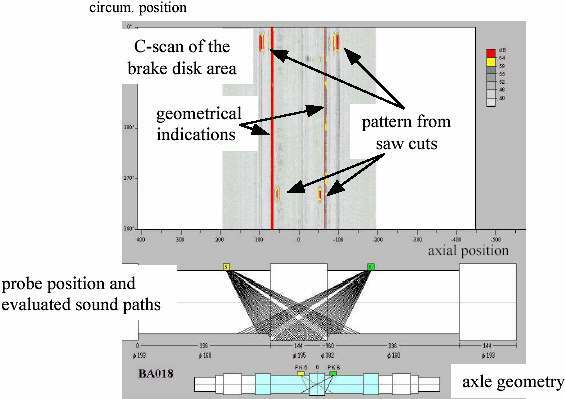 The investigations and experiments carried out in the laboratory for the development and the optimization of railroad axle examination techniques can be summarized as follows: Detection of 1 or 2 mm deep cracks in the shrinkage area of the wheel or brake disk and the adjacent area need adaptable sound fields. Also the limited accessibility between the wheel and brake disk requires flexible sound filed adaptation. Phased array techniques allow the inspection in the whole circumference with one line scan. Due to the geometry of the railroad axle, a variable angle of incidence in the range between 28° and 72° for shear waves is required. Due to the limited accessibility, only a phased array technique can fulfil the specifications laid down by German Rail. Experiments in the laboratory with an op- timized evaluation program give the inspector the possibility for a fast and reliable evaluation of the ultrasonic date. Compared with a drawing of the actual axle geometry also a fast correlation between the detected indication and the geometry is possible. The application of the new technique during the test run of the whole equipment at the maintenance site of the Deutsche Bahn AG showed quite satisfactory results. All saw cuts in a test wheel set were detectable with a signal to noise ratio above 8 dB. Also the time for presenting the ultrasonic data was as required. 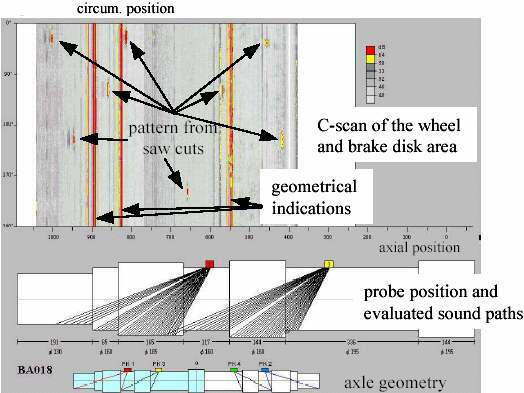 In summary the axle inspection of high speed trains is reliable and practical technique for detection of defects in railroad axles and therefore provides a means of improving the safety of railroad traffic.